Guaranty Trust Bank Plc (GTBank), remains firm in its objective to deliver banking products and services tailored to meet the diverse needs of its ever-growing customer base by leveraging technology to make banking faster, safer and more accessible for all customers. I love using GTBank due to their wonderful banking system and experience. few weeks back, they created a fast and easiest means of generating a Token Code through USSD on a mobile phone for internet banking, which was published here titled "Now You Can Generate GTBank Token Code Via USSD To Complete Online Transcation". GTBank 737 Code as more than just well rhyming numbers. It’s a simple, smart, and safe way to bank anytime, anywhere and on any device. Imagine if opening an account was as simple as dialing a number from your mobile phone. Today’s post will be on 8 Things You Can Do With GTBank 737 Code, when you know all these things, you visit the bank less and save yourself the stress of running to the bank every moment you need their service or help and the amazing part, transactions using the 737 take less than a minute to conclude. Irrespective of your status or phone type that you are using, as a GTBank customer, you can perform the below GTBank Transactions via 737 USSD Code at the conform of your bedroom (No airtime or data needed). To Open a GTBank Account: Simply dial *737*0# and follow the onscreen prompts. An account number will be created automatically and sent to you via SMS. Account opening forms are NOT required for the signUp process. Once you sign up, look out for your ten-digit account number (NUBAN). You can also use your phone number as your account number at GTBank branches, GTExpress outlets. 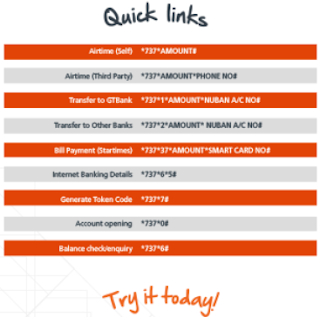 To Transfer Funds to GTBank Account: Dial *737*1*Amount*NUBAN Account Number# (e.g. *737*1*1000*1234567890#) from the phone number you registered with GTBank, then follow the on-screen prompts. To Load Airtime on Your Phone: Dial *737*amount# and SEND from your mobile phone, e.g. *737*1000#. To Send Airtime to Family or Friend: Dial *737*Amount*Friends No# and SEND e.g. *737*1000*08012345678#. To Check for Account Balance on any of your GTB Account: Simply dial; *737*6*1# on your mobile phone and follow the on-screen prompts. One Time Password (OTP): You can now generate an OTP using *737*7# to make a quick transaction on-the-go without your banking token. Bill Payment: You can pay your StarTimes cable subscriptions with ease, by simply dialing the *737*37*Amount*Decoder Number# e.g. *737*37*2500*00123456789#. Hoping that GTBank will add others soon. Internet Banking Login Details: You can now retrieve your mobile and/or internet banking details without having to go to the banking hall. Simply dial *737*6*5# and follow the on-screen prompt. That is all for now, enjoy the amazing features of 737 banking and remember to share/like this post with your friends and families.